Synopsis: Five years into their marriage, the arrival of a collection of inherited furniture puts a strain on Teresa (Chaplin) and Pedro's (Oscarsson) relationship. Contains some spoilers from the first third of the film. 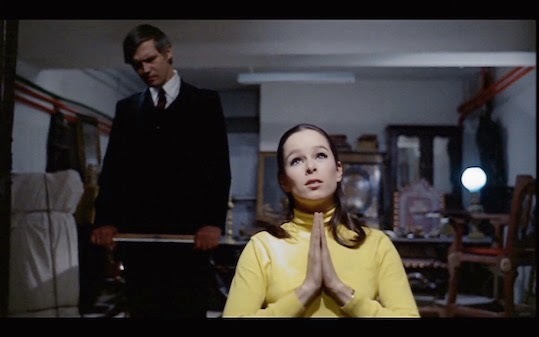 The third of Saura's eight cinematic collaborations with Geraldine Chaplin is an odd film. Teresa (Chaplin) and Pedro (Per Oscarsson - dubbed and looking decidedly un-Spanish (in fact I've belatedly worked out that he reminds me of a permanently peeved Jon Voigt)) have been married for five years and are settled in a routine (he manages - and possibly owns - a factory, she is a lady of leisure) and a rather sterile home. The arrival of a collection of furniture from Teresa's childhood family home triggers a nightmare and subsequent sleepwalking, followed by regressive and childish behaviour. Teresa replaces their furniture (in keeping with the modern - verging on Brutalist - architecture of their house) with what has arrived (which is distinctly different in style, with dark wood and richly coloured fabrics) - the film then settles into a series of extended role play 'games' between husband and wife. I didn't hear an explanation as to why Teresa was receiving the furniture now (there are no subs on the VOD, so something may have flown past me), but it seems like an inheritance. The nightmare triggered by the arrival of the furniture and childhood mementoes appears to be a recollection of being at boarding school, woken by two nuns in the middle of the night and taken to an office (I took it to be the memory of being informed of a death)...at which point Teresa sits up in bed screaming but doesn't wake up. During the subsequent sleepwalk she unpacks the first of the furniture - an armchair and a rug - and proceeds to act as if her father is sitting in the chair: she implores her father not to send her away, says that she wants to stay with him and the rest of the family, and begs him not to make her marry Pedro. Pedro - who has followed his wife during her sleepwalk - at this point sits in the chair and takes on the father's role, asking what Teresa wants to do instead of getting married ('go to college' is her reply). 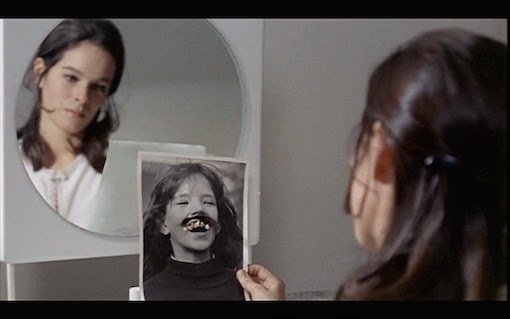 Later in the film when Pedro goes through some of Teresa's possessions he finds photos of her as a child (contemporaneous with her appearance in her nightmare), a child's drawing of a plane crash (with 'Mama' and 'Papa' written next to two bodies) and a funeral notice - the suggestion is that Teresa's parents died when she was a child (supported by her nightmare), but that doesn't really fit with the conversation with her father during the sleepwalk. The next day Teresa has no memory of the night's events - and is visibly embarrassed when Pedro tells her some of the things she said - but becomes increasingly giggly and childish as she continues to unpack toys and mementoes (she glues her milk teeth and a keepsake loop of her infant hair onto a photo of herself as a child), and seemingly decides to use what Pedro has told her about the sleepwalk in order to force her husband to play with her (he thinks that she is sleepwalking again but the audience knows that she has deliberately woken him up). After this point the role play games blur the lines between dream and reality (the blurring of dream, performance, and reality would be something Saura would develop in much greater detail in his next film - El jardín de las delicias / The Garden of Delights (1970)) and Pedro's perception of reality is also altered. At the same time, the question of who is 'playing' whom (in the double sense of who they are actually meant to be, but also which of them is in control of the game) fluctuates. There's a caustic humour and an undercurrent of violence to many of their interactions - Pedro bites Teresa's ankle while he's pretending to be a St Bernard rescue dog (long story) but doesn't take kindly to her smacking him in the face with a mop handle as a result - and as in the later Ana y los lobos / Ana and the Wolves (1972) there is an uneasy sense of foreboding to the games. 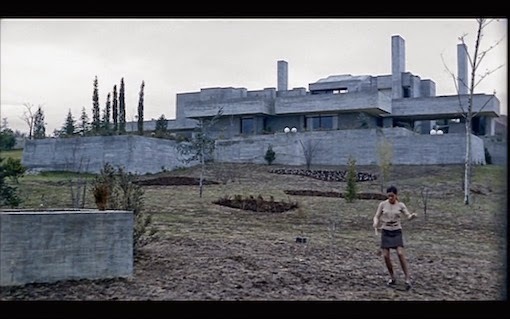 'Honeycomb' seems to be the title given to the film when it was released in the USA, but a literal translation of the Spanish is 'The Burrow', which makes more sense given the centrality of the house to the story - all of the scenes between Teresa and Pedro take place either inside the house (designed by Javier Carvajal and located in Somosaguas (an affluent neighbourhood in Madrid) - other examples of Carvajal's work) or in the surrounding garden. The sense of a limited and clearly defined space gives the film a theatrical feel, as do the curtains they pull across the floor-to-ceiling windows, and overall it is quite a stagey production. 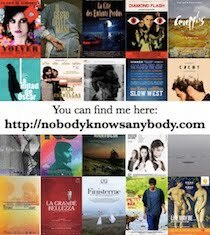 It also picks up the recurring motif in the Saura/Chaplin collaborations of the actress playing multiple roles or personalities (whether real or imagined) within the same film, or the idea of women performing different versions of themselves to different 'audiences' - the expressiveness of Chaplin's face (not to mention her gameness in throwing herself into various outlandish scenarios) is put to full use, but she also clearly delineates the different women she performs through gesture and body language as well. As I mentioned in relation to Peppermint frappé (1967), Chaplin's performances might be an element for me to explore in more detail at a later date - the fact that Peppermint frappé and La madriguera are often said to form a trilogy of sorts with the elusive Stress es tres-tres (1968) (unavailable in any form) makes me wonder whether she takes on multiple personalities in that one too. I don't know that I'd recommend La madriguera as I found the hysteria somewhat forced and Oscarsson a bit wooden (although as he was dubbed into Spanish, that may not be entirely his fault) - but it has a curiosity value given how difficult it is to get hold of (it has never been released on DVD and has appeared on VOD only in the past year).